Angela Lewis File Photo/Chattanooga Times Free Press The Delta Queen is shown docked at Ross's Landing in Chattanooga. 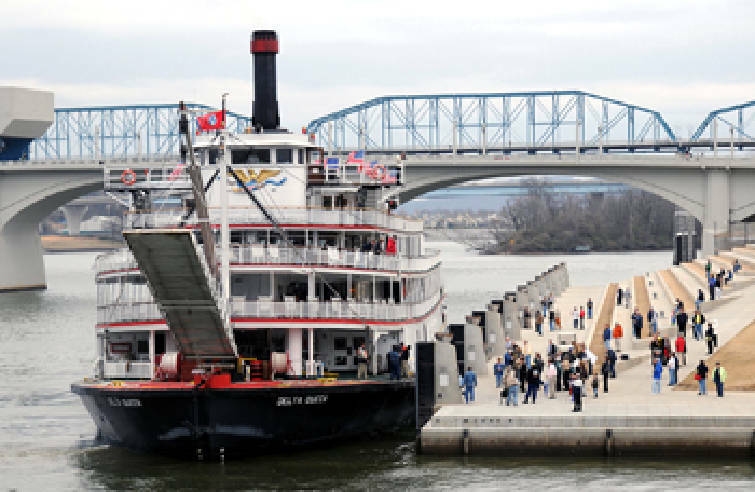 The Delta Queen's days in Chattanooga could be numbered if a local effort to establish a nonprofit for the purchase of the 83-year-old steamboat doesn't pull through. Though the Delta Queen has been listed for sale since late 2008 by its owner, Seattle-based Ambassadors International Inc., operators of the steamboat and hotel docked at Coolidge Park are worried about it being sold and moved from the city. Delta Queen LLC leases the steamboat on a month-to-month basis, said Leah Ann Ingram, who operates the steamboat and holds its lease agreement with her husband, Randy. "The boat is a huge asset and a huge national and international draw for Chattanooga, and we just want to keep her here," she said. "A lot of the people who have come and looked at her, they want to take her apart and do different things with her and not preserve her American history." * What: Tours of the boat begin at noon, with a calliope concert at 4 p.m., progressive dinner at 6:30 p.m. and live entertainment and desserts at 8 p.m.
* Cost: Tours are $8 for adults, $4 for children 12 and younger; overnight packages that include two tickets to the progressive dinner, entertainment event and a standard or deluxe cabin are $389 per couple. Ingram said she and her husband have been rallying support to establish the Delta Queen Preservation Foundation, a nonprofit organization to purchase the steamboat, listed at $4.75 million. She said negotiations are ongoing with Ambassadors International about the asking price. "Ambassadors is interested in continuing the legacy of the Delta Queen and will evaluate proposals from interested parties who wish to purchase [it]," Vanessa Bloy, spokeswoman for the company, said in an e-mailed statement to the Chattanooga Times Free Press. If nonprofit status is approved and the foundation is able to purchase the steamboat, the group would be responsible for keeping the boilers, engine, wheel and paddle running, Ingram said, while a for-profit organization would operate the hotel portion. Julie Dodson, director of marketing for the Delta Queen, said she is confident it will receive nonprofit status but doesn't know when. The Ingrams are planning a "Rally on the River" event next week to gauge support for keeping the Delta Queen in Chattanooga. Proceeds from the Nov. 4 event will go toward the preservation foundation, and attendees can make pledge donations that will be used toward the purchase of the boat. The rally will include guided tours, a calliope concert featuring the Belle of Cincinnati, the Southern Belle and the Delta Queen, a dinner and live entertainment. Ingram said the event is critical to getting the support and money needed to keep the historic steamboat in Chattanooga. The Delta Queen, originally built as a passenger vessel, was used by the Navy to ferry wounded troops during World War II. It spent years as an overnight passenger vessel on the West Coast and in New Orleans until late 2008 when Congress failed to renew the steamboat's exemption to a law prohibiting wooden structures from carrying 50 or more passengers overnight. In early 2009, the boat relocated to Chattanooga and has been used as a boutique hotel since. "I think it's a very important part of history, American history, that Chattanooga can be involved in and, since we are a river city, there's a lot of other cities that would love to be sitting in our position," Ingram said. "It would be a great loss for Chattanooga to lose her." Contact Brittany Cofer at bcofer@timesfreepress.com or 423-757-6476. Follow her on Twitter at twitter.com/brittanycofer.